1 What is Immobilizer and why is it important? 2 Which cars have Immobilizer? 3 Which Immobilizer System does my Car have and which Procedures are applicable? 4 What Information is required for Immobilizer Procedures? 5 How does the 7 digit PIN/SKC work? 6 What else needs to be done after Keys are matched? What is Immobilizer and why is it important? The Immobilizer prevents the car from running unless an authorized key is present and has been properly matched to various components in the vehicle. Several different Immobilizer schemes have been used for different years and different models of vehicles with different procedures that apply to them. The components of the Immobilizer system that require special procedures for replacement include the keys, Engine controller (ECU), and the Instrument Cluster (or the separate Immobilizer modules in vehicles so equipped). In some cases other Modules or Parts may be Immobilizer related as well, for example newer Audi Models also have the Transmission as Part of the Immobilizer. In the US/Canada, most VW/Audi models prior to model year 2000 did not have Immobilizer. In the rest of the world, Immobilizer usage was introduced earlier. In most vehicles the Immobilizer Control Module is integrated into the Instrument Cluster. Upper Class Vehicles like the current Audi A5, A6, A8 and Q7 have a separate Immobilizer in Address 05 - Acc/Start Authorization. Many of the older non-US market vehicles as well as some US-Market VW Golf Cabriolet (1E) and VW Transporter/Eurovan (7D) have a separate Immobilizer Control Module Address 25 - Immobilizer. Which Immobilizer System does my Car have and which Procedures are applicable? The Length of the PIN (4, 5 or 7 digits) it not directly relevant to the Immobilizer Generation/Model. Immobilizer Generations are not pinned on a certain Date, they are Model and in some cases even Country/Market specific. None: Cars without Immobilizer will not have a symbol in the instrument cluster showing a key inside a car and will start and run as long as you cut a new key that is able to turn the ignition. The key may also have a W with a strikethrough to indicate that Immobilizer isn't present. If in doubt, check the Factory Repair Manual for your specific vehicle. Keys for vehicles with Immobilizer 1 usually have a small F on the key blade, which stands for Festcode (Fixed Code). Immobilizer 1 Vehicles were sold in the Rest of World (RoW) Market only, not in the North American Region (NAR). If in doubt, check the Factory Repair Manual for your specific Vehicle. Immobilizer 1 can also be identified via the Immobilizer Identification/Serial Number. All VW, Seat and Skoda Immobilizer 1 Serial Numbers contain 3Z (for Example VWZ3Z0S1101234), if you see something else there it is unlikely you have this Generation at hand. Audi models as well as the early VW Passat (3B) may show different Serial Numbers, so this does NOT apply to these models. Many 2000-2001 Model Year Vehicles sold in the North American Region (NAR) have Immobilizer 2 and there are other Rest of World (RoW) Vehicles with Immobilizer 2 which started earlier than that around Model Year 1998. To identify an Immobilizer 2 Vehicle, use VCDS to Select the Instrument Cluster (or Address 25 - Immobilizer in Vehicles with a separate Immobilizer Control Module) and look in the Extra Field. 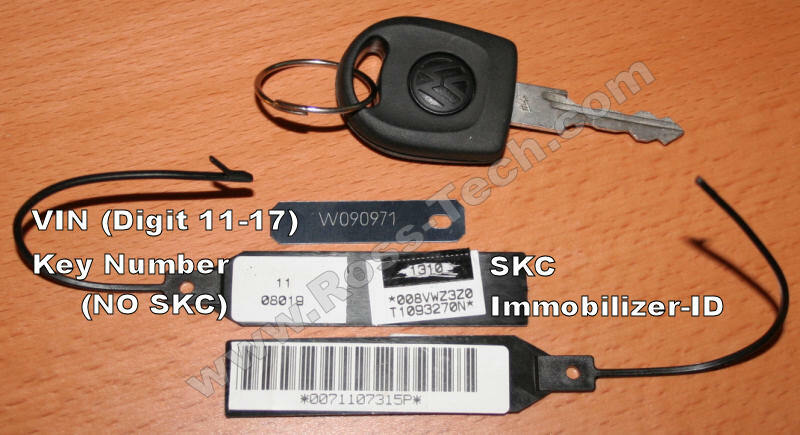 You should see a 14 digit Immobilizer ID Number such as Immo-ID VWZ7Z0W0648696. There should NOT be a 17 digit VIN Number in the Extra Fields. If in doubt, check the Factory Repair Manual for your specific vehicle. The North American Region (NAR) market VW Cabrio used two different generations of Immo 2, depending on whether the vehicle was built before or after 05/1999. Early production NAR Cabrios with 25- Immobilizer part numbers beginning with 6H0 are Immo 2/Gen 2. Later production systems can be identified by the 6X0 serial number which is Immo 2/Gen 3. Many 2002 and newer Model Year vehicles sold in the North American Region (NAR) have Immobilizer 3 and there are other Rest of World (RoW) Vehicles with Immobilizer 3 as well. Use VCDS to Select the Instrument Cluster (or Address 25 - Immobilizer in Vehicles with a separate Immobilizer Control Module) and look in the Extra Field. You should see BOTH a 14 digit Immobilizer ID number and ALSO a 17 digit VIN number in the Extra fields like this: WVZKB58001H231169 VWZ7Z0W0648696. The first 17-digit string is the VIN and the second 14-digit string in the Immobilizer ID. Keys that have been previously matched to a different Immobilizer 3 System cannot be reused with another one (which has a different Immobilizer ID). In some cases, you'll need to check in the Engine Control Module in Measuring Value Block (MVB) 081 to see the VIN and Immobilizer ID. If in doubt, check the Factory Repair Manual for your specific vehicle. Many newer cars including all of the Golf/Jetta (1K) Models use Immobilizer 4. There are different varieties of Immobilizer 4 Implementations, some of them don't show a 14-digit Immo-ID anywhere, but rather a "Challenge" Value in Advanced ID. This Challenge changes every Time Terminal 15 (Ignition) is cycled. Ross-Tech does not support Immobilizer 5 procedures at this time. What Information is required for Immobilizer Procedures? VCDS can match Keys to your Car, but only if you have the specific PIN Code for your particular Car. Prior to 2002, some vehicles were delivered with a scratch-off Panel on a Plastic Tag] that contained the 4 digit PIN Code, some Manufactures like Seat and Skoda used this methods up until 2008. Prior to April of 2005 (US only), it was possible for Vehicle Owners to go to their Dealer with Proof of Ownership and the VIN and Immo-ID (the latter can be read with VCDS). The Dealership would punch that Information into an Online System that would give them the PIN. At that point they were able to give it to you. Unfortunately VW/Audi has eliminated that System and now the dealer never sees the PIN. The GeKo System sends it directly to the Dealers' Scan Tool, which sends it to the Car and does the Key Matching - without ever showing the PIN to anyone. There are Locksmith Supply Companies that sell Products that purport to be able to extract PIN Codes, which could then be used by VCDS. Just as they sell Lockpicking Tools to legal Users, those Tools could also be used for Criminal Purposes and as a Result, we do not sell or recommend them. For the US Market the National Automotive Service Task Force (NASTF) has been working with automakers including VW to hopefully provide some form of access to Immobilizer information using the Secure Data Release Model (SDRM). erWin offers some Immobilizer and Pass-Thru solutions which are mentioned under the notes section of our Official Factory Repair Information page. The following Chart shows what Information is needed to perform each Procedure. The Requirements and Steps differ depending on whether the Component you are installing is brand new, or if it has been previously matched to a Vehicle. Please understand that this is a general Chart and there may be exceptions! How does the 7 digit PIN/SKC work? Our Manual has a Page dedicated to the 7-digit PIN/SKC Dialog in VCDS. 7-digit SKC that the Dealer retrieved for your exact Immobilizer ID Number. Date on which the 7-digit SKC was retrieved by the Dealer. Workshop Code (WSC) for the Dealer that retrieved the SKC. Importer Number for the dealer that retrieved the SKC. The 7-digit SKC is useless without the other three Items. Unlike the Factory Diagnostic Tools, with VCDS, the same PIN can be used for a particular Car at any Time in the Future, as long as you keep track of the PIN, along with the Date on which the PIN was retrieved by the Dealer, the Dealer's Workshop Code (WSC) and the Importer Number. What else needs to be done after Keys are matched? On most Vehicles the Immobilizer is separate from the Remote Controls, so these would need to be matched separately and Details for these Procedures can be found on the Model specific Pages of our WIKI. An Exception to this Rule are those Vehicles with Keyless Access and Start (KESSY), for those the Remote Controls are usually being matched automatically together with the Immobilizer.